Carbon Capture and Storage (CCS) is an emission reduction process designed to prevent large amounts of carbon dioxide (CO2) from being released into the atmosphere. It is considered a key and necessary technology to actively reduce industry driven greenhouse gas emissions (GHGs). CCS involves capturing CO2, compressing it for transportation and then injecting it deep into a rock formation at a selected site, where it is permanently stored. The separation of CO2 from other gases produced at facilities such as coal and natural gas power plants, oil and gas refineries, steel mills and cement plants. Once captured and separated, the CO2 is compressed to a “dense phase” or liquid-like state to make it easier to transport and store (liquid takes up much less space than a gas). The CO2 is usually transported to a suitable site for geological storage using pipelines, although some countries use ships and – for smaller amounts of CO2 – trucks and trains can also be used. Permanent Storage. The captured CO2 is transported to a geological storage site and then injected deep underground where it is permanently stored. Utilization to Storage via Enhanced Oil Recovery (EOR). The captured CO2 is transported to an oil field and is used to stimulate more oil production, with the CO2 then being stored in the oil-depleted reservoir. For more details on EOR & Storage, see Fullchain and/ this factsheet. CCUS stands for Carbon Capture Utilization and Storage. Essentially it is CCS that also enables the “utilization” of the CO2. However, CCS\CCUS are often used interchangeably. Increasingly there are several emerging forms of CO2 utilization – for example as an additive to improve the integrity of products, such as cement. The volumes required for these by-products, however is small and hence negligible toward the goal to mitigate climate change. Alternatively, large volume CO2 utilization occurs when it is applied to EOR activity which has the added benefit of permanently storing the CO2 underground. CO2 is captured to prevent large amounts of it from entering the atmosphere. CO2 is the greatest contributor to global warming, and large-scale CCS is the only technology that can help our planet meet the 2oC climate goals set out in the Paris Agreement. Several global organizations including the International Energy Agency, and the UN International Panel on Climate Change (IPCC) recognize that much of the world cannot meet their emission reduction targets without large-scale CCS. Research affirms that without CCS, the median increase in mitigation cost is 138%. In and effort to see a permanent shift to lower or non-emitting types of generation, in 2015, Canada implemented the Reduction of Carbon Dioxide Emissions from Coal-fired Generation of Electricity Regulations, setting a stringent performance standard of 420 tonnes of CO2 per gigawatt hour (t/GWh) for new coal-fired electricity generation units and units that have reached the end of their useful life (nominally 50 years). 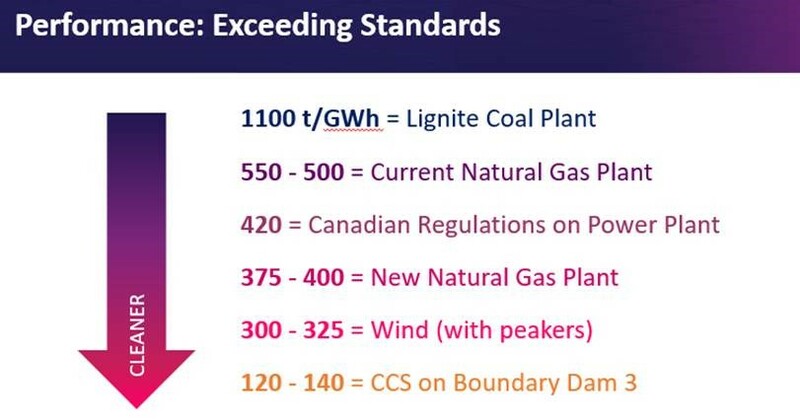 SaskPower's Boundary Dam CCS Facility (BD3) designed operate as low as 120-140 t/GWh, surpasses the Canadian standard by three times. The greatest gains in CO2 emissions reductions, in an electrical system without the ability to add hydro or nuclear facilities, are realized with CCS. How Does the Capture Process Work? How CO2 is captured involves chemistry. Simply put, the flue gas goes into a big vessel called an absorber which is filled with layers of structured metal packing that is continuous to the sides of the unit (like a metal sponge). This increases the contact between liquid and gas. Next, a chemical solvent (called an amine) is showered into the vessel that targets the CO2 gas. The amine reacts with the CO2, absorbing the gas into the liquid before accumulating in the bottom of the vessel. The amine is then sent to a stripper, which is a chamber that heats the liquid to release CO2 back into a gas. The amine which is now free of CO2 is recycled back into the absorber to repeat the process and capture more CO2. The CO2 gas is compressed into a supercritical state and transported by pipeline to be permanently stored or used for EOR. Why Large-Scale CCS for Energy and Industry? It is well documented that CO2 concentrations in the atmosphere have been steadily increasing due to human activities and that the earth is on a trajectory of unprecedented climate disruption. While there are many ways in which GHGs can be reduced, such as adding renewables into the energy portfolio or increasing efficiency of power plants, these steps alone will not achieve the required reductions in CO2 emissions and deep reductions are needed now. CCS is a critical technology in helping solve the problem. CCS is applicable beyond the energy sectors and can be applied to industrial sources of emissions, which have limited abatement options such as iron, steel, concrete, and agriculture. In recent years, analysts and governments have recognized that some of the world’s most carbon-intensive industries may have no alternatives to CCS for deep emissions reduction. This is because; CO2 is generated not only from their use of fuel, but also, unavoidably, through their production processes as well. Widespread use of CCS can be achieved without the need for rapid change in the energy and industry supply infrastructure. This will allow countries to meaningfully aid in decarbonizing electrical grids as well as transition to carbon-free energy systems in the future. CCS offers the world flexibility and time to make the leap to cleaner systems. It means we can retrofit, rather than replace, vast parts of the global infrastructure and maintain industries that employ millions of people around the world. CCS is therefore an essential part of the portfolio of technologies that is needed to achieve deep global emission reductions.